A friend of ours came across this while out and about. 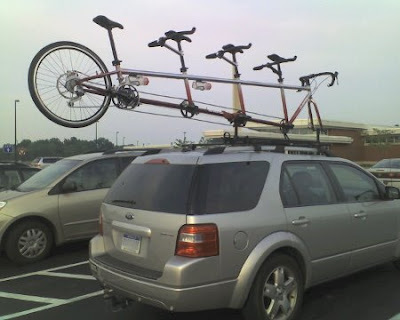 Nice "quad" (four-seater tandem bicycle)! We're all for unique and whacked-out bike configurations; whatever it takes for you to enjoy the ride. What we don't recommend is how it's being transported. That much weight without any support under the rear wheel can NOT be good for that bike's frame! As a reminder, all three of our stores are CLOSED on Sunday, April 12 for the Easter Holiday! 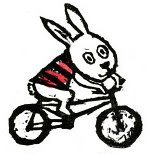 Hopefully, we'll be out on the bike trails practicing our bunny hops! Wow, and I thought our tandem on a Scion xA was odd looking. Not to be funny, but how in the H E double toothpick do you transport a thing like that?